Yay, I am using 3mm hook and DK acrylic yarn this time. 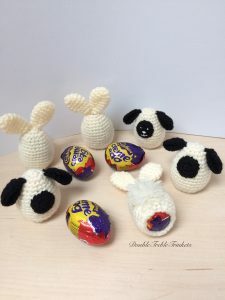 This entry was posted in Easter, Other and tagged Bunny, Cream egg cover, cream egg cozy, easter. Bookmark the permalink. It makes such a welcome change from chickens, thank you. These are so sweet and nice change from the usual chickens thank you.